It’s a book called “Pirate Haiku” – do you really need an explanation? Ok, it’s also calls itself “Bilge-sucking Poems of Booty, Grog, and Wenches for Scurvy Sea Dogs.” Clear now? Wait, what the hell am I saying? This is supposed to be a review of a pirate haiku book, and I’m prattling on about the lack of seasonal references? Who cares, so long as there’s rum and seaborne violence? And Pirate Haiku dishes these up in abundance. There is, in fact, an entire chapter dedicated to rum, and another to wenches. And another, even, to pirates vs. ninjas, which would seem fitting considering the book’s format. 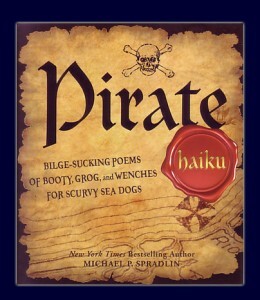 Pirate Haiku would seem a perfect bathroom reader – something to pick up and grab a random page now and then. But in this it’s misleading because, to my own surprise, Pirate Haiku contains some semblance of a plot. These aren’t random selections, but rather poems with a progression from one to the next. A story is told, references revisited, and in-jokes formed and enjoyed. And this is what sets Pirate Haiku up a notch or two from being a mere collection of silliness. It should be enjoyed from beginning to end and in that order, because at the end of it all there is indeed a madness behind the method. This entry was posted in Books and tagged michael spradlin, poetry by Bilgemunky. Bookmark the permalink. You just like it because it says “Bilge sucking”. Remind me to send you a copy of “Cap’n Slappy’s Parade of Pirate Poetry,” (available at http://www.talklikeapirate.com!) which is a third Pi-Ku, a third Limmericks (the drinking man’s haiku) and a third random musings and observations as only Slappy can voice them. The man has never had an unexpressed thought!